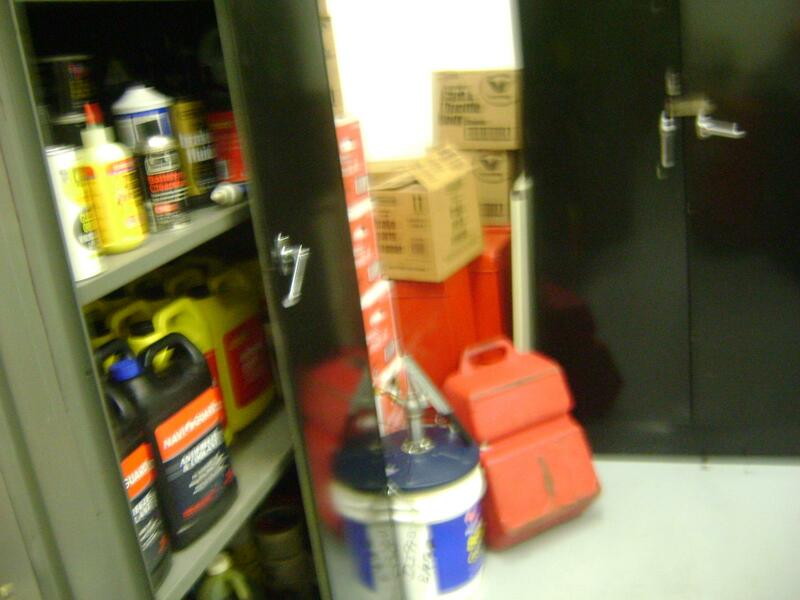 A container of caustic carburetor cleaner. No MSD sheet or protective gear. I wish all these pictures were photoshopped and not taken in high schools and tech colleges that are the training centers for our next generation of techs and service employees. No I will not say where these are taken. I am invited sometimes to visit auto training programs and often asked by the administration to take a look. I am asked to tell them if they should continue to fund the program or hire another teacher. All of these are the Bad and Ugly of programs. The good have been reported on earlier in posts and there are many fine, high quality programs with motivated instructors. Sadly these “Hobby Shops” are out there and have been going for years. Most of the ones where these pictures come from have been closed or have been overhauled. On these visits I have permission to video and take pictures. I then cite the safety reasons, NATEF standards and generate a report for the administrators. Incandescent glass bulbs should never be used in any shop. Even rough service bulbs heat up and can cause burns and fires. Just got this http://youtu.be/T7ESQzY6spI please get rid of any glass incandescent lamps, drop lights etc. Is your lab or student worth a cheap light? Thanks Bob! Yes the incandescent bulb will cause gasoline to explode if a drop gets on it when hot. Several shops burn every year due to the use of these. The hot metal of the frame will burn skin if touched by a hand or arm. Yes the handle on this light is taped up from a previous pulling out of the cord. IMHO these types of lights have no place in a lab. I know personally of two retail operations that burned due to the employees use of these lights. I see these in labs. Please get rid of them and use something that will not harm a student. Note the wire brush has no safety guard. I assume the chair is for sitting if you get tired working? 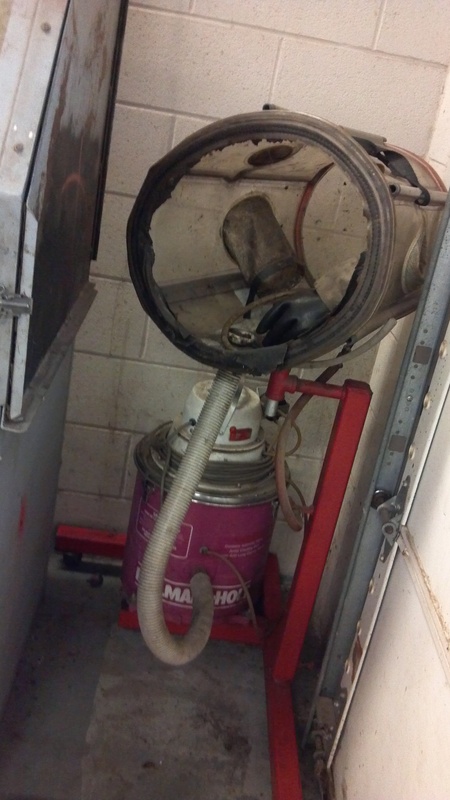 The grinder was not bolted down and there was no sign of eye protection or face shield. You know a wire brush sheds wire if you have ever used one. If you use one of these wire brushes on a grinder or power tool note that old brushes rapidly shed the wire pieces and they will stick in clothing and skin. Hate to know what they do to an eye. I suggest if you have to have one of these you replace it regularly and have a full face shield for the user. 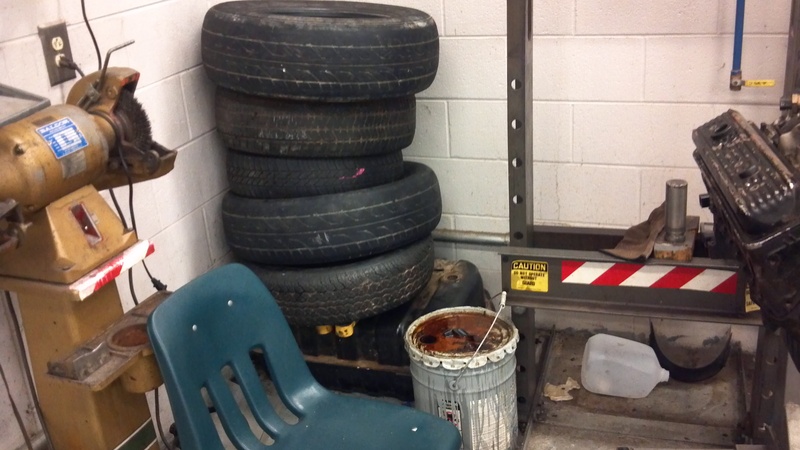 The stack of old tires is a disposal problem, certainly only a few are needed for instruction. Safety of the student is paramount in any evaluation of a program. If a student is injured during the lab time no matter the cause or outcome, the accident is a problem for the instructor. Even minor issues that are bound to happen like small cuts and such are a hassle. Some instructors have gone their whole career without a serious incident. 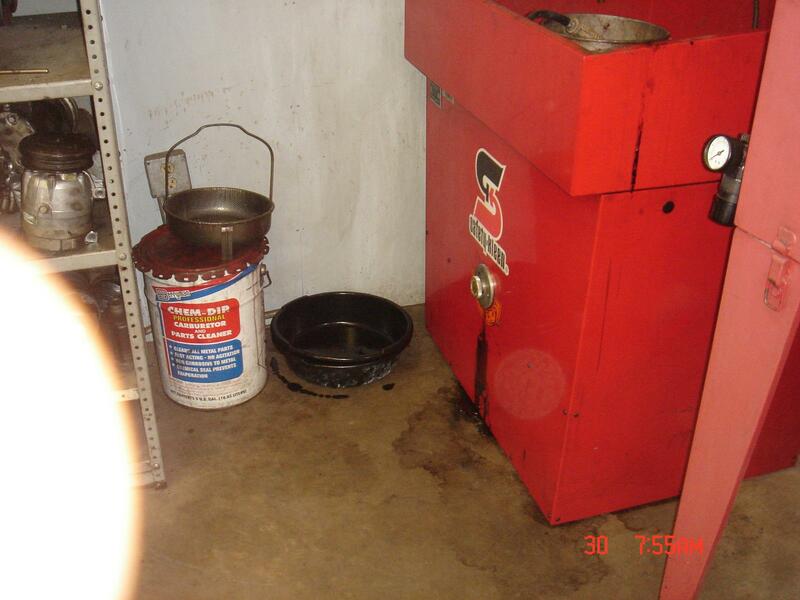 Operation of an training lab involving sharp objects, extreme temperatures, moving, rotating machines, hazardous chemicals, flammable liquids and gases and high voltage circuits is difficult in a safe organized shop. Teaching in the environment shown here in these pictures would be next to impossible. This exhaust hose reel is missing the hose. 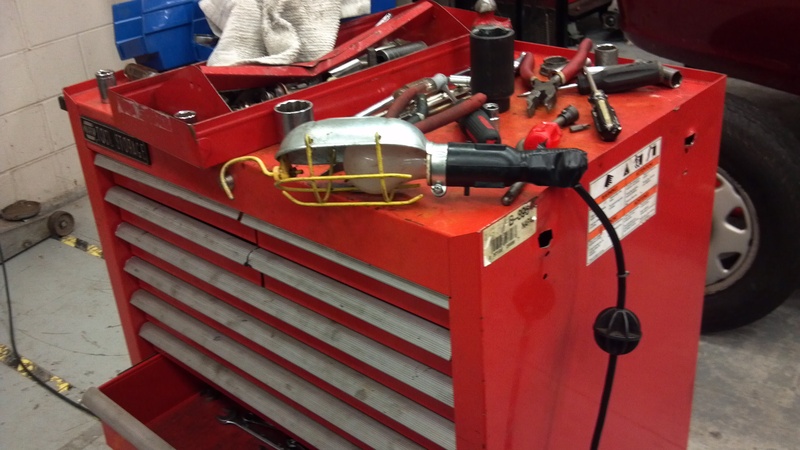 Running an engine in the lab requires the use of exhaust extraction. Passive systems may work but I doubt the effectiveness on all application. Every time I have observed a passive system in use, the students complained of head aches. This is due to CO as the first symptom is headache. 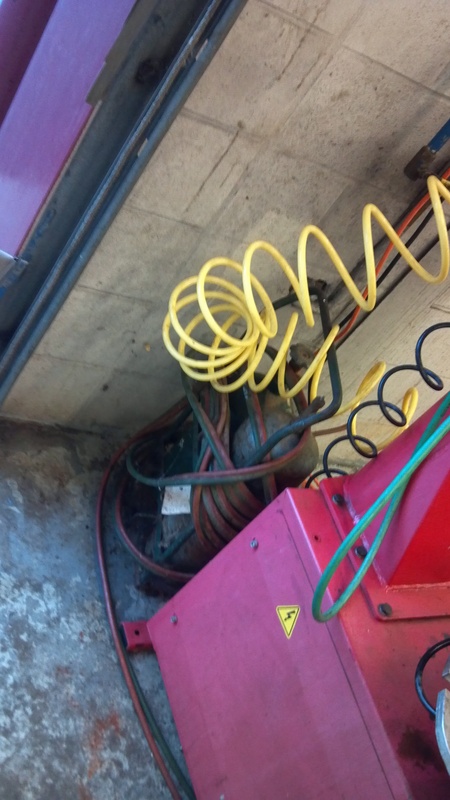 The tire machine is not bolted down. I assume the acetylene torch set keeps it nice and secure? A face shield would be nice. So would proper storage of consumables. 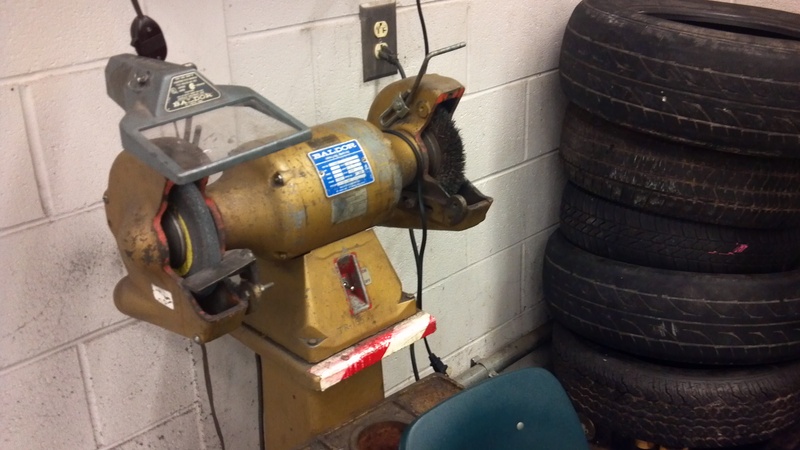 Lot of these older brake service machines give good service, but this one has no safety guard. Note the storage or lack of it. Consumables everywhere in this lab. 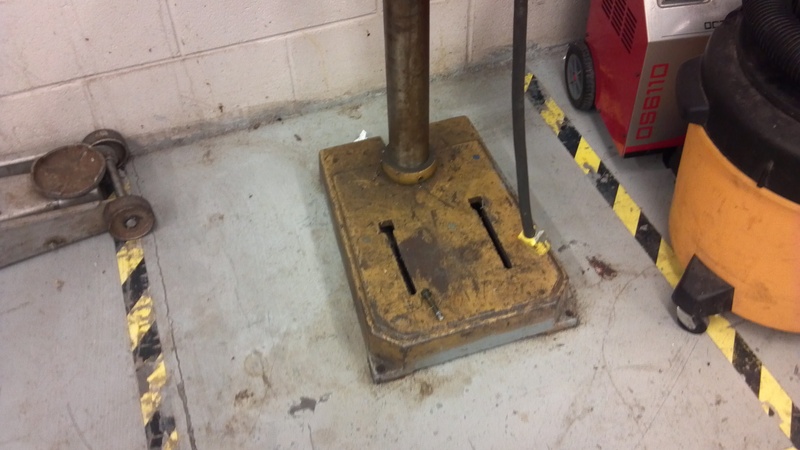 Top heavy machines can tip over and should be bolted down. Looks like the Exxon Valdez looking for a place to land. 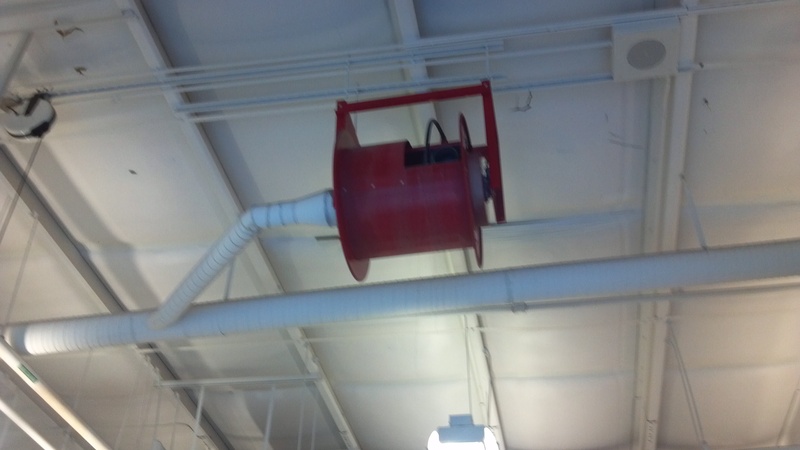 What many school systems don’t realize is that OSHA and EPA can fine them for things like this. Besides being a fire hazard the training of future techs is being done here with this as an example to them. I was called to one of the new Charter School known as County Academy Center of Technology. Well the name does not make the insides better. This program had been transplanted into a new building and the administration wanted to know why enrollment dropped from when it was at the high school. Anyone that understands children as teens knows they hate to give up their peer group and move to a new school that has no sports or clubs like a comprehensive high school. These programs can become dumping grounds for the feeder schools. This was the lift that was being used. 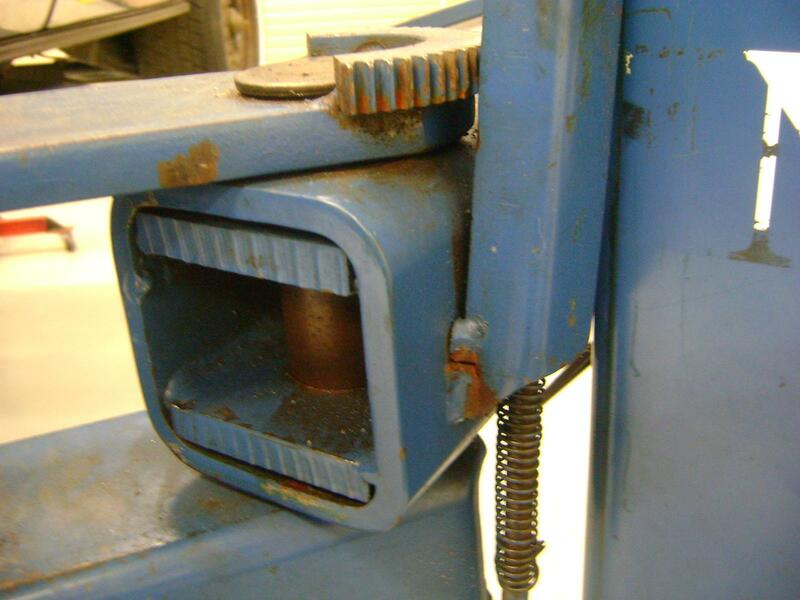 The welds were broken on the safety latches and this prevents the engagement of the locks for the arms. All four lifts were broken. While there I observed students working with no safety glasses on under the lift. I explained this to the administrator as a safety violation that could put him in jeopardy. Lifts should be certified every year. This lift is also broken. 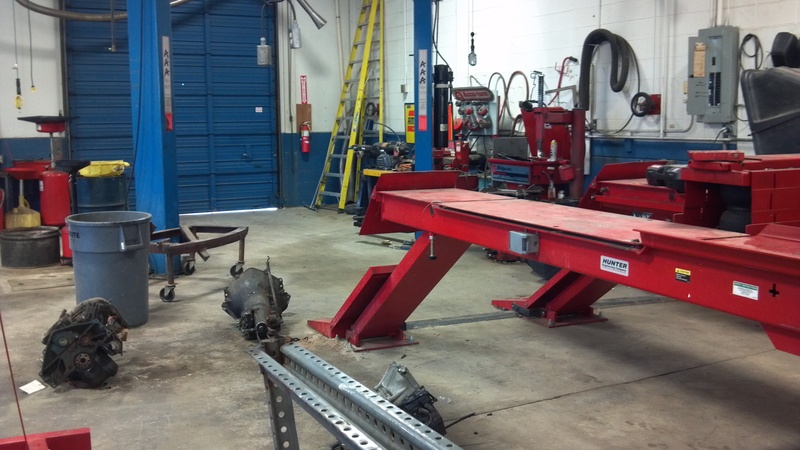 Improper placement of lift and raising a vehicle not set up correctly caused the arms to force the safety locks. This lock no longer lines up. 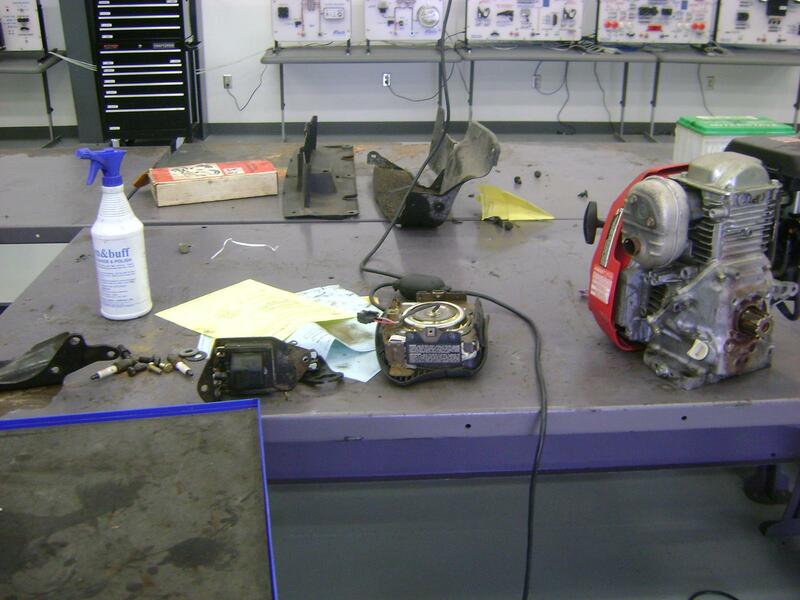 The same lab had tools and equipment scattered. 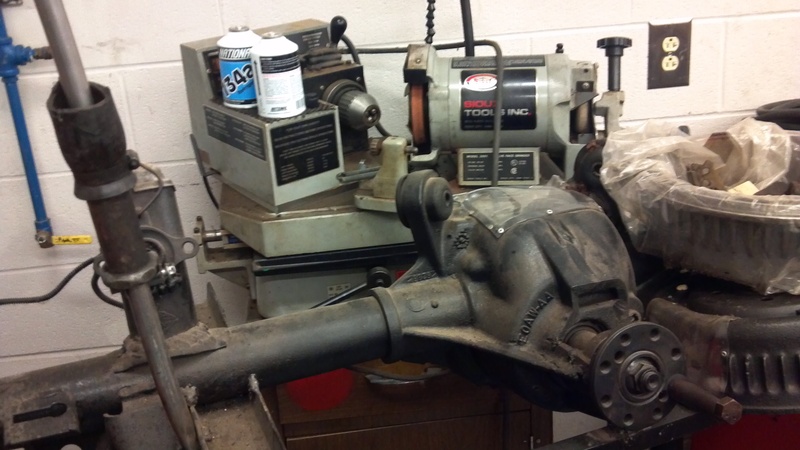 This lab was shared with a tech college for a night class with an adjunct instructor. I have not seen this type of program work anywhere. The adjunct instructor often as not is a by the hour paid teacher and has no “Buy In” towards the program. Often time they are working for a college nearby and must keep up their own lab also, they simply don’t have the time. 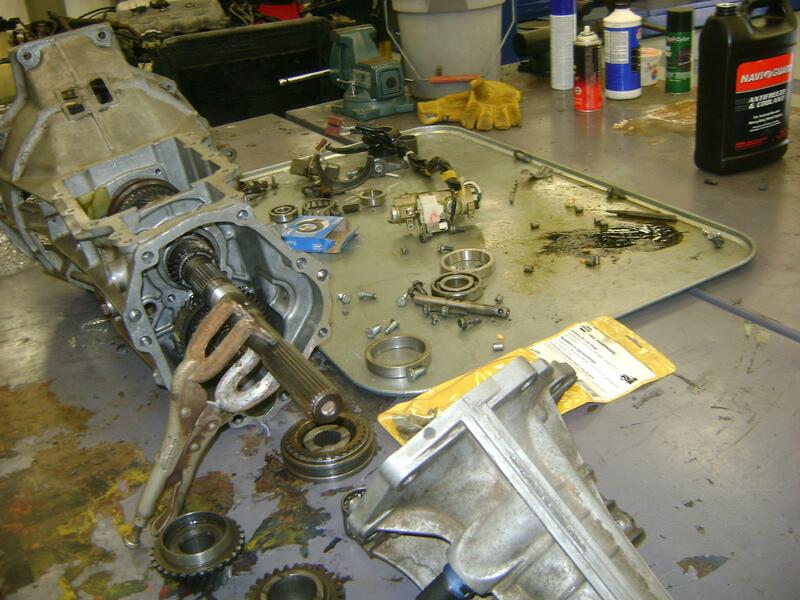 Here is an air bag, battery and assorted parts on a steel table. This project had parts over a wide area. No lab job sheets, task sheets or performance tests means there is a hobby shop atmosphere. Use project boxes for lab work that will be left over to next day. 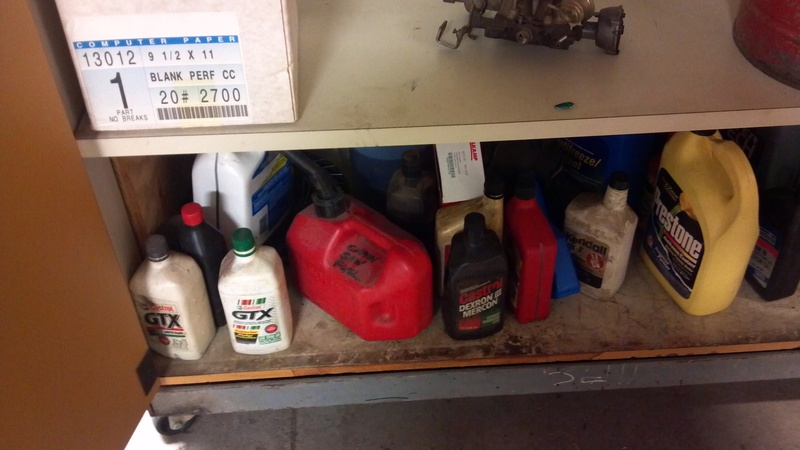 Gasoline storage is only allowed in approved storage lockers. Not in tool room. 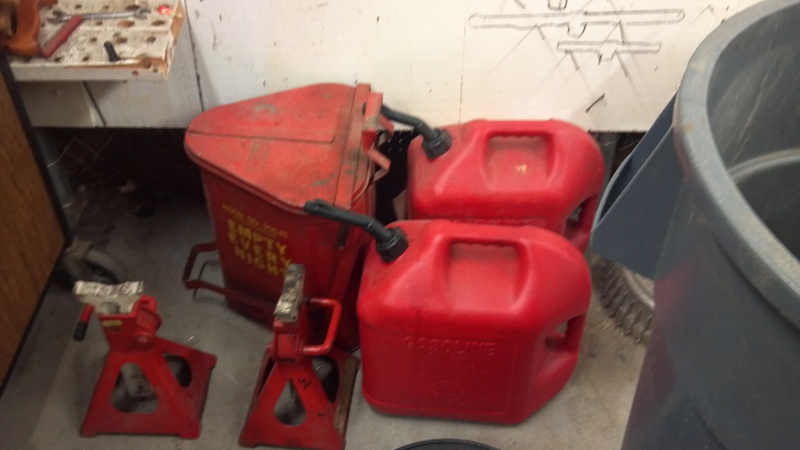 The tool room had no organization and several gas cans with fuel in them. 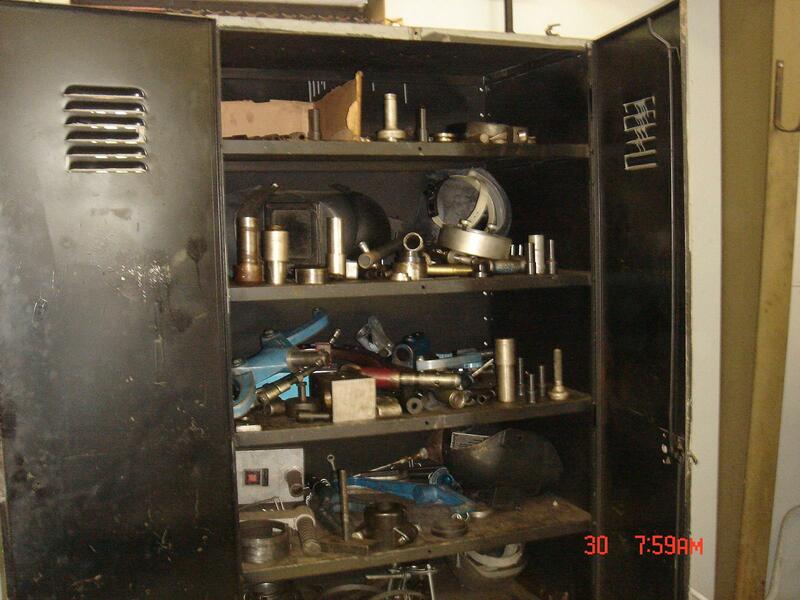 Parts bins can be used for projects. This hobby shop had none visible I opened a locker and found these tools. The administrator continually said how good the instructor was. We asked for safety glasses while we were there and the instructor left the room to find some. He never returned before I left. No Flammable locker and gas cans all over. Has no one ever seen a gasoline fire? 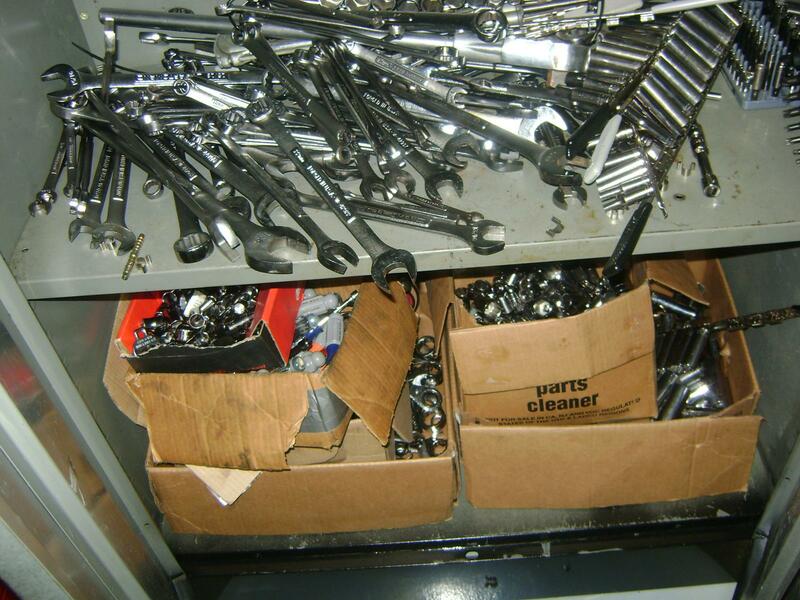 Clutter makes it hard for students to find the right tool or the part they were using. When I observe a lab like this I know that the instructor is overwhelmed and overworking because of a lack of organizing skills on the instructor’s part. Safe operation of this lab is almost impossible. No wonder the turn over for auto teachers is high. The main issue here is all the electrical demands of the shop floor are fed by the extension cord plugged in on the center of the wall. There was no organization of any of the tools or equipment. This is right in the lab with a plastic trash can nearby to add to the mix. 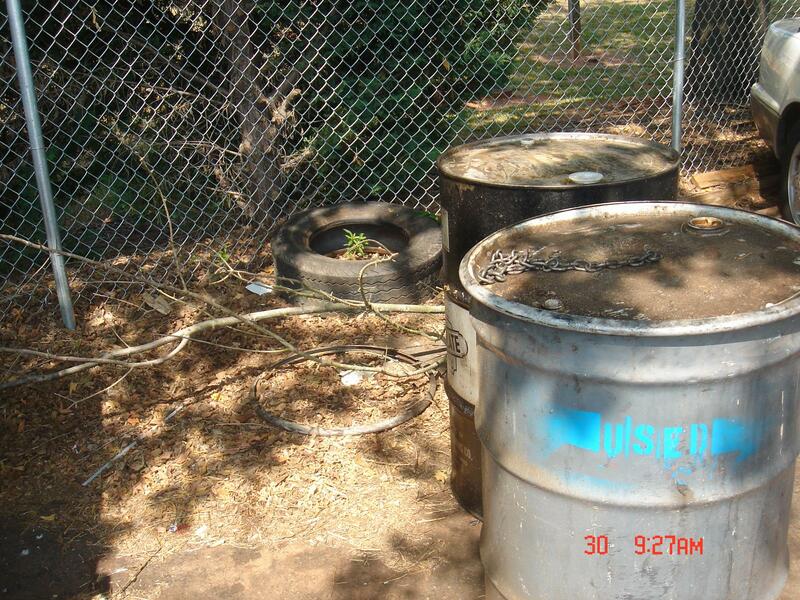 These plastic trash cans give off poisonous fumes when they burn in the lab. Nice ! This school is in a very well off county with lots of tax dollars. Seems the school board wanted to close the program. I was asked to evaluate the program. Over 60 auto dealers with in 20 miles and the only contact was a few phone calls to invite the dealers to an open house a few years ago. The teacher had been cut to half time. 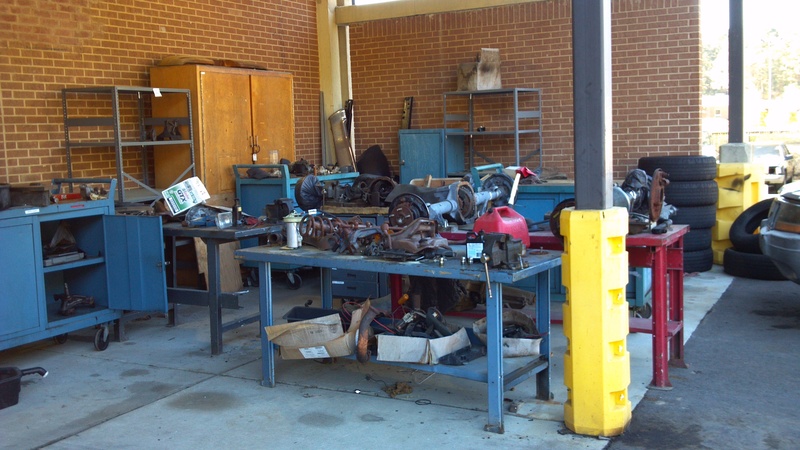 The instructor had cleaned up for my visit and had hauled off many truck loads of junk left over from a teacher that had retired. The admin of the school just wanted the problem to go away. This one is closed now. 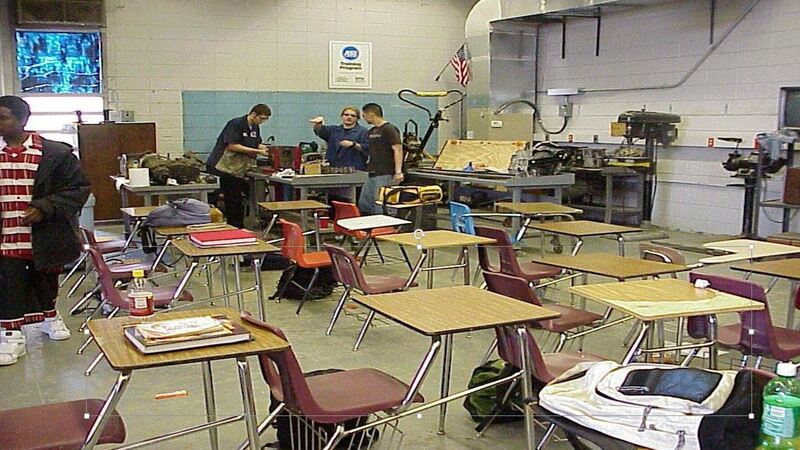 General clutter with no organized learning area. Hard to tell if anything safe can be accomplished. 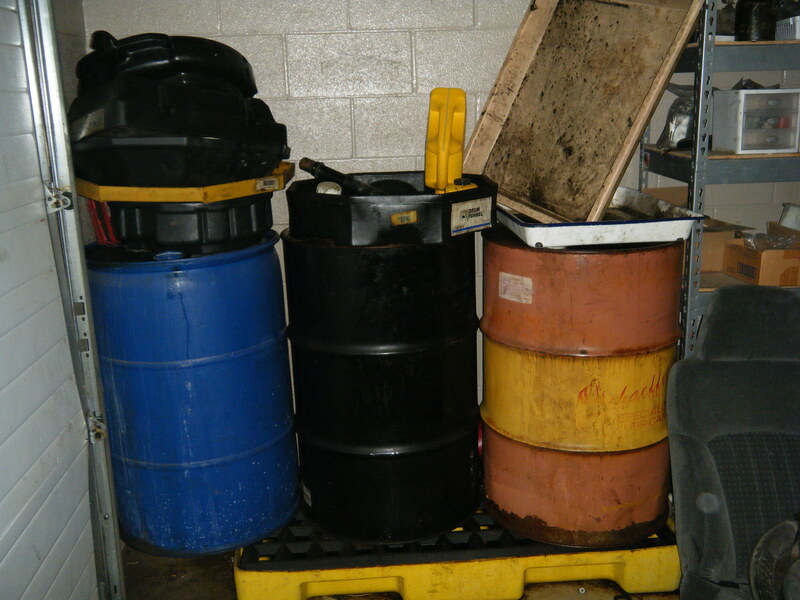 Outback we find oil drums with unidentified liquids in them. Who is responsible? A tool locker for special tools? Special tools are just that “Special” Students should be taught that they command respect from their users. 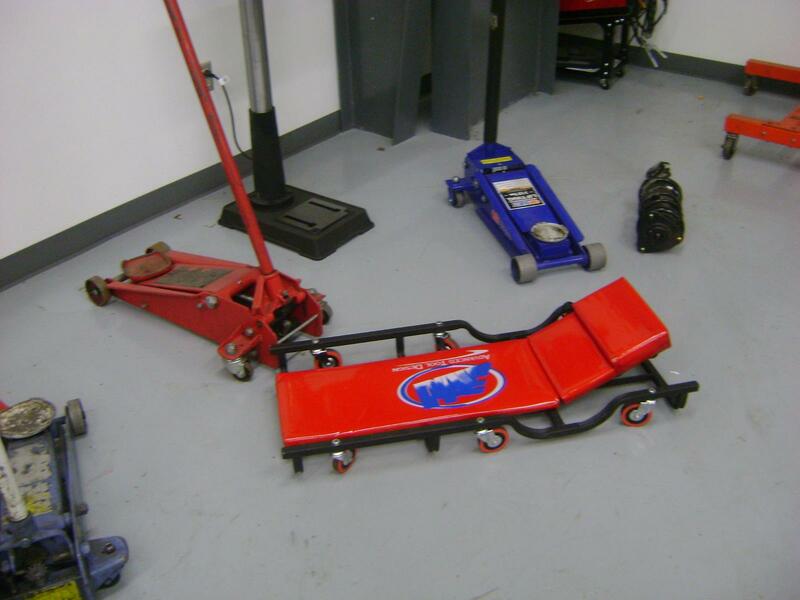 Instructors should realize that every tool should have a place identified and well marked with the name of the tool, operation manual included for proper storage of the special tool. The assumption that any student would know how to find or use a special tool is, well foolish. This lab was considered by the administration to be the best possible . This clutter was here on two separate visits. This lab is totally redone with new equipment and quality instructors. On the day of the visit when this was taken the school resource officers arrested a student with drugs in the lab. Now on the advisement from the advisory committee new teachers were hired and the program is now one of the best. A classroom in the lab area is sometimes unavoidable. While not the best situation. Safety Glasses must be worn by all persons in the room when work is being done. This program had lost their accreditation a few years before this picture. The program has since been totally overhauled. The schools often don’t see the safety issue as some unsafe practices are accepted in industry believe it or not! Outside storage is cluttered and unused parts seem to collect in these places. 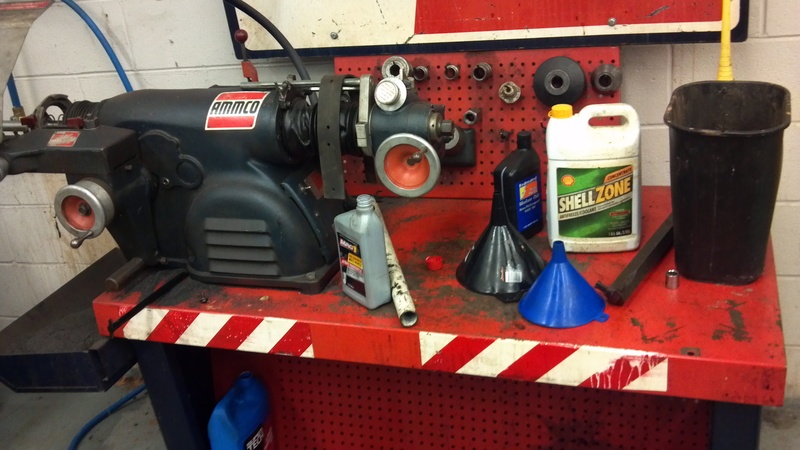 Here you have a old valve machine, a differential out of something and two cans of AC refrigerant along with a grinder missing guards and brake drums. The point of this picture is that there is no instructional organization. An antique machine that never caught on to handle a very hazardous material. 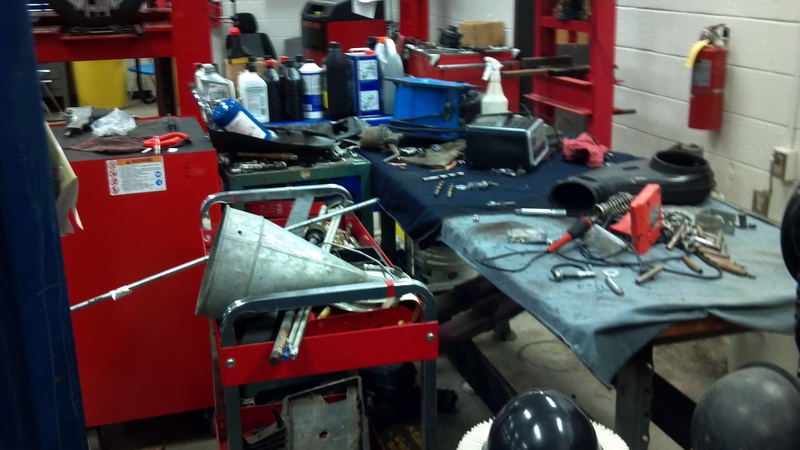 The average auto teacher is overworked and under paid. Got your attention! We could spend the rest of the week complaining and debating this statement. I recently toured European schools and the teacher’s number one complaint is the lack of time. (Note: see Dec Blog about time management) Same as here, we do not have time to shift gears or implement new ideas until the summer, winter, or spring break, if we are not completing personal courses of study, working on personal improvement or family experiences during those short times. Our classes are overwhelming in these times of bad economy when everyone that can’t find a job or seeks retraining wants to be a technician of some sort at the Technical College and in our High Schools the rigorous requirements of NCLB impact us in painful ways. It would be a lot easier if no one ever brought up the notion of being industry certified, would it not? What are some of the reasons your program is certified? What are the reasons it is not certified or the certification has lapsed? Let’s look at both sides here and try to be positive, open and realistic in our examination of this controversial subject. Many times I have presented workshops for teachers to learn the NATEF process only to discover later that nothing changed at their school. Why? Lack of support is often blamed but why would the administration send the teacher to a workshop and then not support them for certification? One of the many items we covered in the workshop was how to apply for the industry certification grants the state provides. I discovered in some cases schools got the grant, spent it and did nothing else. A few never bothered to write the grant. When asked why they admitted procrastination or blamed someone who is now gone. Sometimes Administration would blame the teacher and while in some cases the teacher may be the problem, the teacher says otherwise. Let’s look objectively at several possible scenarios and examine the cause and effect of the different paths we can take. If we take a positive look at the NATEF process we will discover all the items we see as being negative are a positive improvement for our programs overall health. I can show you that each of the standards used properly will benefit your students, the auto program and make the teachers job easier in the long run. If you have not read the standards I would advise you do so soon. They are located here http://www.natef.org/program.cfm I will be referencing them in this essay. We can begin our process by developing our advisory or Business and Education Council. I know of no really great program that does not have a viable, dynamic and focused advisory. Sure, it is a pain and a lot of work to develop the relationships, and hours are spent going from place to place meeting new people, organizing and planning the events. See https://autoteacher.net/AYES_Page.php for helps and tips on developing and maintaining the B&E council. What does the Advisory do in a well run program? What NATEF Standards do they have input and direction? Std. 2.3 T&E, 6.5, 6.14, 7. 7.5, 8.11 If you allow the stakeholders to work with you on these you will share the burden of implementing the standards. If we need new tools and equipment and who does not? We can plan a list based on the standards. 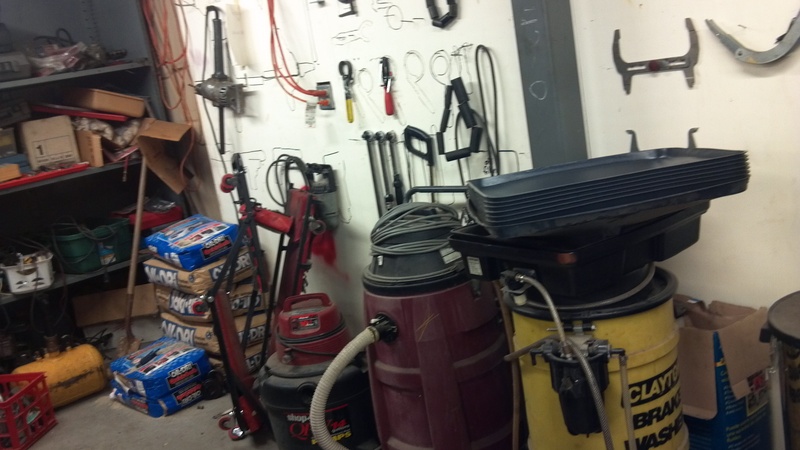 NATEF does have a list of hand tools, equipment and special tools that are considered necessary for training. http://www.natef.org/program_standards/auto.cfm I will not bore you with repeating what is written in the document. I will share with you this true story. A career center was planned by a school system. A well-meaning administration got a copy of the tool list and found some tool dealers and sent them the list. The bids were looked at and the lowest bidder picked. The building was built by the system. All the labs were designed alike. The tool bid winner asked for the number of students in a class and sold the school system 24 sets of every hand tool. Can you imagine 24 police grade Mag lights? The lab got offshore brand equipment, can you say not certified safe lifts and substandard special tools? Can you imagine dial indicators that fall apart when used or micrometers that don’t mike? Can you see a multimeter that burns out in a week of student use? Textbooks were ordered off the list from the state without review to see if content was relevant. Trainers that are not transitional trainers are bought at high prices that student learn nothing on except to operate the games. The money ran out before the alignment lift could be ordered. Several key big-ticket items were not purchased. The well-meaning administrator then looked for a teacher via the DOE channels. The teacher they hired had failed as a technician and the system he had worked as a teacher before was glad he moved on. Three years later the program is closed for lack of students. What could have been done different? Could the NATEF standards have prevented this expensive mistake? Consider this scenario. Now what are your objections? Here are a few common ones. I would love to hear your story if I do not cover it here. This is a structure problem with a lot of high schools. Consider articulation with a post secondary and only certify your program in two areas. Consider a work based learning co-op program with local businesses for after school mentored training. 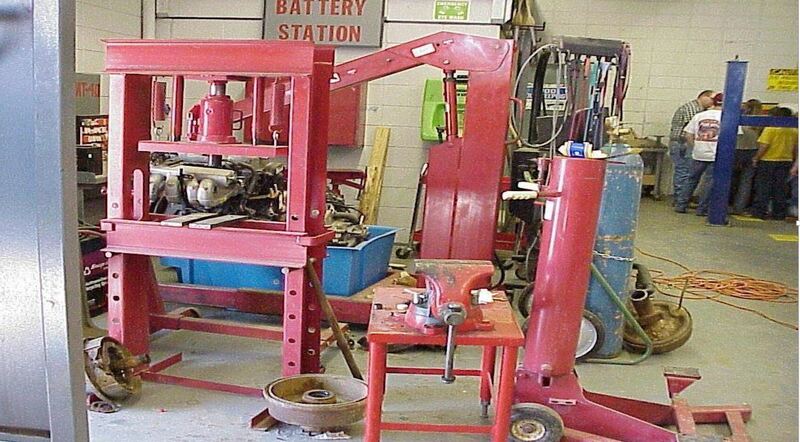 Consider the General Service Technician Training Program, GST Certification which is according to the instructors I have talked with that are using the GST model works very well for Secondary schools. Consider adding a summer internship class or summer class to add more contact hours. Explore the new Std 11 and step into the 21st Century with your students. If done carefully learning can become constant and time the variable. You can place 25% of your instructional time into the e learning category if you follow the standard. Some schools only have 50 minute classes. While this may work in a History class and is fine for teaching Spanish it will not allow for safe and proper delivery of a lab class. A shop/lab teacher with requirements to teach hands on subject matter with a performance based assessment (std 6) can not safely and efficiently do the tasks in a 50 or 45 minute period. Clean up/ Lab set up time eat up effective instructional time. Present a plan to combine periods for your students in these short periods. A 100 minute class will give the organized teacher time to teach and the students can perform in a safe learning environment. The schedule and/or registering requirements of students should not place them in unsafe labs. 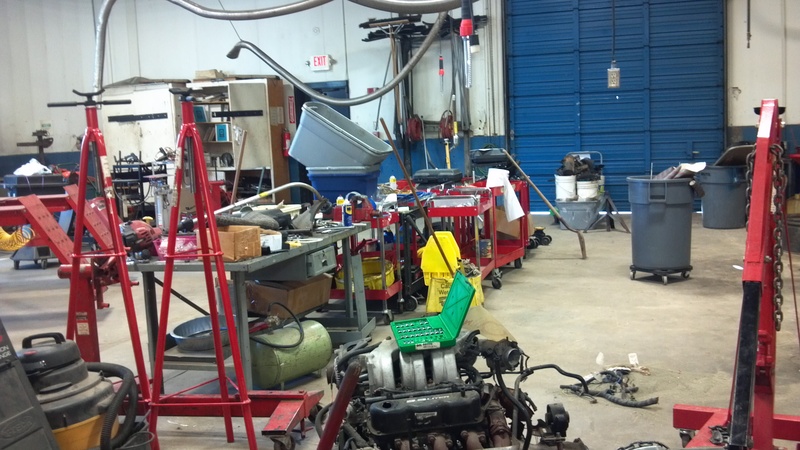 Currently there are several grants out there for auto teachers. Are they going to call you up and deliver the cash? No, are they going to write themselves? No, Do you have to be a skilled grant writer? No, I obtained many grants by asking many more than I got. Were they hard to write? No, some were fill in the blank online and easy, some were difficult and required a team to develop. In a recent work shop I presented at NACAT 2010, an instructor from California shared how she had a grant from a source I quote http://www.grants.gov/ Her school will get $2 million for Hybrid, Alt vehicle study. Another source is to take a Skills USA student to the local civic clubs and have them speak, a 3-5 minute speech on why they are in Skills, or auto and then you talk for a few minutes on your program and the benefits to the community. Then ask for donations! I do know this if you don’t ask you won’t get. Is the NATEF process perfect? No, nothing with us humans is. We can work together to make a better NATEF. The NATEF staff are certainly focused on helping you. 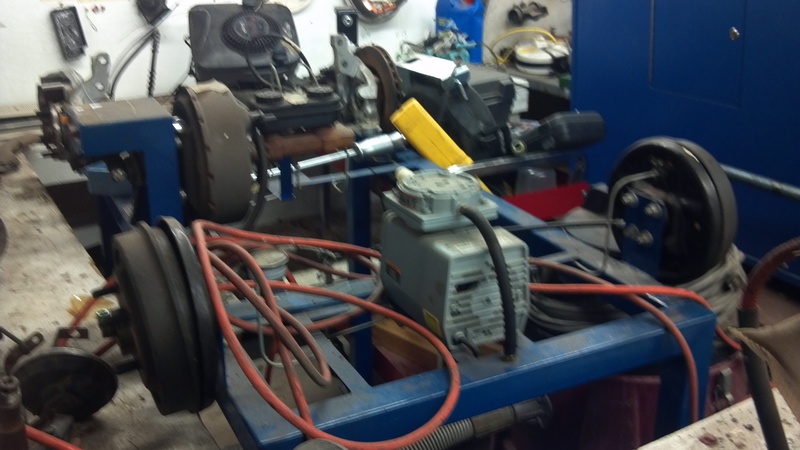 The NATEF President knows what you face each day having been an auto teacher and a technician. No one likes change but wet babies but our industry is changing so fast; only by staying on top can you deliver the technical instruction the new market place requires. You are currently browsing the archives for the NATEF Accreditation category.